OK, so we don't have steelhead or salmon in our resident waters, but they are just over the hill on the Salmon and Clearwater, plus all across the nearby Northwest rivers up to Alaska. If you've fished any of these waters recently you'll be hard pressed to see a single-hander. Trust me, you'll never regret taking up the two-hander. Plus, once you've got it nailed, you'll not only find yourself spey casting with your single-hand trout rod, this will open up a whole other dimension using a 4 or 5 weight spey rod, medium sink tips, and swing big bugs underneath for Big Sky browns, bows, and bulls (incidental catch). In 1989, after a decade or more of single-hand shooting heads and launching Teeny 200s until I had a right arm like a gorilla, I made the conversion to the long rod. 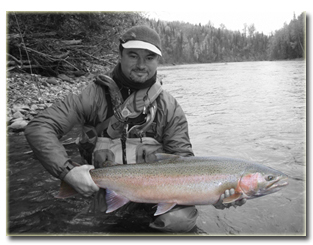 I did so to cover water more efficiently, fish water I couldn't fish with a single-hand rod, and spare my shoulder and elbow, all the while pursuing my passion of the swung-fly for steelhead on the rivers of the Northwest. Now I just love to spey fish and teach others to do the same. In those days rods were few and spey lines for them non-existent. We made our own lines - chop shops as we called them - and taught ourselves how to cast. Now I'm here to help you get into spey fishing by reducing the casting learning curve I went through. I'm a fly fishing steelheader first, casting dude last. My philosophy is safety, simplicity, get in the game, hook more fish,have fun doing it and don't fear the cast - that's my job. It's about getting your fly to the fish easily and efficiently, over a range of fishing conditions without self-inflicted body piercings. To do this, you don't have to launch a 120 foot laser beam like the photo above, but you will need to master the fundamentals. After all, casting is only a means to an end, but spey casting offers something special.